We arrived in Dover with some trepidation as the last two times I had made a ferry crossing with DFDS both boats had been cancelled which resulted in long delays. However, our fears were unfounded this time as all sailings were present and on schedule. As an added bonus, there were also some other classic cars on our ferry that were attending the Poppy Rally at Ypres. There was even another Mk1 to keep Gertie company. After an uneventful crossing we reached Dunkerque and set out for the long haul over to Beekbergen in North Holland. Just before the Antwerp ring road what looked like a long strip of toilet roll came floating across the motorway and disappeared under the car. I looked in the rear view mirror and waited for it to exit the rear of the car, but it was no good. We'd snagged it. A little while later while in stationary traffic we heard a 'shh, shh, shh' noise and then all of a sudden lots of little streamers of this 'toilet paper' came out through the bonnet louvres like paper through a shredding machine! This was followed by a burning smell which forced us onto the hard shoulder to investigate. The 'toilet paper' turned out to be a sheet of thin polystyrene which had been destroyed by the fan and melted on the manifold. With all this removed, we carried on and reached our hotel at 6pm CET. After a quick wash and brush up we investigated the local town to get some dinner. We did find a shop called 'The Slageri' but it wasn't selling what we thought it might! We then found a restaurant which had 'Ghoulash Croquettes' listed. I asked what they were and the gentleman behind the counter pointed one out in a display case and said 'It's one of those but I don't know what's in it'. I decided not to risk it and settled for Bratwurst and Frites while Dave settled for a good old fashioned Horse Burger. Saturday morning we discovered the the fluffy white stuff that had been terrorising England all week had followed us and taken up residence where we were. However, it wasn't too bad and by lunch time it had all disappeared. Walking around the town again we bumped into fellow CT Essex members Mike and Gillian Helm who had caught the night boat over from Harwich and arrived that morning. All too quickly, the afternoon flew by and it was time to head to the start location at the Wok Chinese Restaurant. As usual, there was a varied range of cars taking part and a good turn out too. With the lovely Chinese food consumed and the drivers briefing complete we headed of into the dusk following the tulip diagrams. I have to say it was a lot easier with the brantz trip meter now fitted and it's going to be one of those things that makes me wonder how I ever got by without one before! We made the half way stage with no problems and enjoyed the Coffee and cake that was on offer and then just took a leisurely drive round the pitch black lanes and eventually back to the Wok Restaurant for the finish. We enjoyed a few beers and a laugh and a chat with some of the 'locals' before returning to our hotel around midnight. Gertie performed faultlessly and needs no repairs, which is a bit of a relief as she's lined up for another night rally this Friday night with Chelmsford Motor Club. After that, she can rest up for a while before the CT Historic Counties Rally on April 13th. Tuesday 12th March. A moment of concern. The Red Shed has now been collected and is residing back in my garage waiting to be refitted with her trim. But more of that another time. The focus at the moment is Gertie's trip to Holland this weekend. After discovering that the heater wasn't particularly good on the trip to Stoneleigh, I had decided to try a few experiments. First of all the heater matrix was disconnected at the hoses and blasted out both ways with a hose pipe. Quite a bit of brown murky water came out before turning clean, so there was obviously some crap in there. Then I poured some caustic soda in there and left it for 30 minutes. While waiting for that to do its stuff I fitted a hotter thermostat. Hopefully the car should get a bit of heat in it now. Hopefully! While looking over the car I found something I didn't particularly want to find. A broken engine mount! Luckily, I managed to find one in my spares box, (My last one!) so after jacking the sump up on a piece of wood I managed to squeeze the new one in place and get it fitted. Actually, it's a second hand one but it's probably better than the rubbish being produced by certain manufacturers at the moment. The old one (six months old actually) was quite easy to get out as it had completely broken in two! Lucky I spotted it before the weekend. Sun 10th March-A long, cold day. Sunday morning saw me up at the ungodly hour of 5am and arriving at Colin's at 6.30. The reason for this madness? The Chelmsford Motor Club Targa rally. If you think of the Club Triumph auto solo but with each course four or five times longer and needing a navigator you are almost there! When I started out from Wickford the snow was very light, but the time I was north of Colchester it had increased significantly. By the time we got to the start location at Woodbridge, the snow was coming down again and an icy cold wind was battering us from the East coast. Four CT cars had entered with Colin Wake navigating for Mike Helm, but also Driving his own 2.5pi (In which I was navigating) and Mike Bishop and Darren Armitage in a Herald (Complete with Monte Carlo type roof rack and snow tyres!) and Clive and Lucy senior in a Toledo. Mike and Colin were out first meaning I had a long wait in the cold while waiting for them to return. By the time we started the PI had decided that it was going to save a cylinder for later on and only run on five. As a result, we had a dismal first run and were well off the pace. Colin then went out with Mike again only to return a short time later with a severe transmission problem on Mike's TR6. I haven't yet heard what the problem was, but the transmission had locked up and the car had to be winched up onto Mikes Trailer and transported home. Colin's second run in the PI was completed on six cylinders this time, but time was lost due to spending most it going sideways, backwards, and trying to kill the photographer who thought he had found a safe place by standing on the grass! We were also being watched by Mike and Darren who had managed to almost turn his rear wheel inside out by pushing the tyre off the rim while 'drifting'. While at lunch further investigation of the Herald revealed that despite changing the wheel the whole hub and drum still looked decidedly wobbly! It turns out that Mike had bent a driveshaft during his attempt at knocking a drainage channel out of the way. eventually, we had completed the seventeen tests and after hearing the results in which none of us featured (Front wheel drive hatchbacks seem to have the most success) it was time to go home. After dropping Darren off at Witham to meet Mike at the Rivenhall hotel with Coffee and Scones supplied by Ivi (thanks, much appreciated) I eventually got home about 9pm. A very long, but brilliant day with the worst bit being the constant snow, bitter cold and icy wind! I hope the weather improves before we go to Holland this weekend. I dont fancy another frozen weekend! Saturday 9th March-Time for Gertie. With the Dutch rally coming up next weekend I felt it was time to sort out the exhaust damage that I did to Gertie on the Chelmsford Motor Club rally a few weeks back. I think we did it when we ventured up a 'road' that we shouldn't have done. It turns out I brought a nice clump of Suffolk mud and grass home with me as well! Initially I thought that the rattling noise I was hearing was coming from the front of the exhaust, but investigations revealed that the issue was actually where the exhaust goes through the rear cross member. The nearside cross member is supposed to have two 'forks' coming off of it so that a clamp can be attached to it which then holds the exhaust up so it can pass through the hole centrally. Well one of my 'forks' was missing when I bought the car, so I made up a temporary bracket instead. My temporary bracket had done well to last two and a half years, but it was now deceased! The next best option was to make up a new bracket that was up to the job. By now Gavin had arrived and demonstrated some of his metal work skills by designing a new mount. I have to say, I was impressed and the new piece looks very good and seems to hold the exhaust in the correct place. Unfortunately, I didn't get time to take it for a test drive as my MK2 estate was due at the MOT station at 4pm. I'm pleased to say she passed as well. What with having to hurriedly strip the Red Shed of trim last Saturday and going to Stoneleigh last Sunday, I've Not really had time to update the blog lately, so here's a quick preview of whats going on. A mate of mine rang me last Friday to say that he suddenly had workshop space available to take the Red Shed in. So Friday night was spent in the garage removing the front and rear bumpers and tow bar. Saturday was then spent carefully removing other parts of the trim. Today I took a drive over there to see how he was getting on with it. The nearside rear quarter was the worst part (which I knew) and needed some serious work. In fact he gave me a carrier bag with the remainder of my wheel arch and a huge piece of filler that was in it! Overall, I was pleased with the work he's done. The dent in the nose cone has been pulled out and the lower front valance has had the filler removed and new metal welded in. Some of the paint on the wings was so bad that he has taken them down to bare metal to get a good finish. While I was over there he opened the boot to show me something else that he had found stuffed inside the rear wing 'repair'. As you'll see below it was a Sunblest Bread bag! Now I can't even remember the last time I saw Sunblest bread on the shelves! 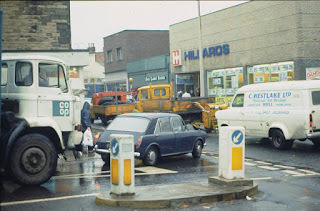 Hillards was founded by John Wesley Hillard in 1885 in the West Yorkshire town of Cleckheaton. The first shop was opened in Lion Chambers there and shortly after 1900 there were 20 shops operating as Lion Stores. By 1951 there were over 70 stores and by 1968 it had warehouse size stores in Wakefield, Lincoln and York In 1970 the trade name Lion Stores was dropped in favour of Hillards and in 1972 the Company was first listed on the London Stock Exchange Peter Hartley, a grandson of the founder, became Executive Chairman in 1983 and in May 1987, following a hostile bid, the business was acquired by Tesco for £220m. I also managed to find a pic of one of their stores.